SUMMARY: Many website audiences are made up of more than one customer segment. The question is if you are best communicating with multiple segments. 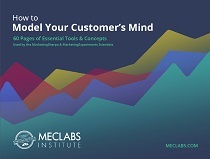 MECLABS, the parent company of MarketingSherpa and MarketingExperiments, provides marketers of all types with information on what works in marketing. The team wanted to know if they were communicating the value proposition of MECLABS' brands in the most effective manner for their audiences. This case study reveals how the team used PPC ad testing to increase clickthrough to the company's websites by 88%. Audiences don't come in a one-size-fits-all package. That presents a challenge, and an opportunity, for marketers. Jon Powell, Senior Manager of Research and Strategy, MECLABS, has discovered that fact to be especially true when it's other marketers who make up the audience. MECLABS is a science lab that uses real-world research to discover what works in marketing. Powell has presented training on different marketing optimization topics to numerous audiences, but a recent training session with a national association opened his eyes to a potential new segment of marketers. What type of content would connect to them? Overall, Powell said, "We wanted to know how to have a better conversation with the classic marketer." Search engine marketing is a great channel for acquiring new customers. It's also an ideal channel for experimentation, as tests require little in terms of resources or time. Powell and his team embarked on a three-part testing series using PPC advertising to discover how to speak to potential audiences in a way that gains their interest. The third phase took place at Web Optimization Summit 2014 in New York City. At the heart of each phase of testing, the company's value proposition helped guide the messaging of the ads. The team hoped each phase would narrow down the ideal message further and further. First, the team needed to determine the most effective keywords to target. This required a few key steps. The team had particular interest in discovering the effectiveness of research-based messaging, as one of its brands, MarketingExperiments, puts much emphasis on research on its homepage. While keyword research seems simple enough, it's an important step you shouldn't overlook. Powell said, "Keywords give us clues as to what customers are interested in." In pursuit of having a "better conversation with a classic marketer," the first step is to have a conversation they want to have. That's where the research comes in. Powell researched types of search terminology used by marketers and discovered two keyword groups: marketing strategy and marketing research. These metrics would help them determine which keywords they could get the biggest bang for their buck. For example, "marketing strategy" had the least impressions, but it also had the highest clickthrough rate and the lowest CPC. Before testing the selected groups, the team looked at the MECLABS value proposition to see how they could incorporate it into the PPC ads. Those claims were then assigned to one of the two keyword groups based on which the claims supported best. He tried to keep the messaging structure of the ad the same to better isolate the difference in the content. Lastly, the team tested the two ads in a popular search engine. To ensure they would reach validity within the parameters they set, they used the MECLABS Validation Tool to project the minimum sample size and test duration needed. "The test validated in just three or four hours," Powell said. Which PPC ad performed best? The research-focused ad decreased clickthrough by 62% compared to the strategy-focused ad. The test results indicated that marketers were more interested in strategy-based content. Powell had this hypothesis about the results: "Research requires work. The classic marketer is overwhelmed enough as it is and would rather get something they can use immediately." After determining the most effective keyword group — marketing strategy — the team wanted to know which value claim best attracted potential visitors. For this phase, the team decided to focus its efforts on the MarketingExperiments brand instead of MarketingSherpa. This second phase mirrored some of the previous phase’s steps. As part of value proposition development, MECLABS has identified eight potential claims of value for its MarketingExperiments brand. That significant difference allowed the team to feel comfortable focusing their upcoming efforts on that segment. Again, to isolate the test variable, each PPC ad used similar wording and structure. Powell and his team then set up the three ads to compete against one another in a split test. Which value claim best matched the motivation of visitors searching for information about marketing strategies? The "Best Marketing Strategies" PPC ad won by increasing clickthrough by 37%. Powell said he believed the test resulted this way because "customers care more about authority than usefulness when searching for this type of help." For the MECLABS team, Phase 3 incorporated some outside help. As part of a live test performed at Web Optimization Summit 2014, the audience was asked to help develop the test. On day 1 of Summit, Powell provided the audience with background information to set the stage. The winner of Phase 2 would be the control for Phase 3 of testing. While using value claims can create broad messaging, using evidentials, or supporting facts, can provide a value claim more authority. The audience had free reign how they used those evidentials. They could use none, or they could incorporate multiple proof points into their ads. Powell also provided them with a tool to craft those ads, the MECLABS Ad Optimization PPC Tool. It allowed the audience to quickly craft ads that adhered to formatting and character limits set in place by the search engines. With all the tools and information they needed, the Summit audience gathered in groups and crafted treatments to submit to Powell and the team. In total, the team received 50 ads from the audience. The team then narrowed that down to five treatments. Powell described the reasoning behind the selection process: "The goal is not just to get a lift, but to get a learning. So we wanted it to be somewhat progressive or to be connected in a way that would give us a learning." The audience was then asked to vote for one treatment, and the top two treatments would be tested against the control. After settling on three ads, the team launched them by mid-afternoon on day 1 of Summit. A winner validated by the evening. Audience Choice 2 had an 88% relative increase, with a 99% level of confidence. To know if the results were significant, Powell used the MECLABS Testing Tool. We've covered the numerical results in each phase, but this series of tests was about more than relative lifts. The goal was to learn about MECLABS' customers. Powell reviewed this with the Summit audience. "In both cases, the audience ads have a level of specificity the original ad doesn't. You can even argue that 'free' played a part," Powell said. He then asked the audience, "Why did Choice 2 outperform Choice 1?" "One underlying common denominator for each of these ads is authority. It seems as the perceived authority increased in the minds of customers, so did the results," Powell explained. For the average marketers looking for strategy help, the evidentials provided in Choice 2 could appear to hold more clout or authority. So do patented guides carry more authority than years of research? Do proven tests mean more in the mind of customers than case studies? These are questions worth further testing. But it certainly shows an interesting discovery about the MECLABS audience. That's what the live test was about: demonstrating how valuable customer insights can be discovered in as little as two days.